Limited supply - only a few sizes are available. Amora Super Ideal H&A Earrings: Our Dazzling Amora Super Ideal Eternity H&A 4-prong Martinis, in Platinum, with Protector Locking backs. Universal (or flat) pricing offering improved pricing! 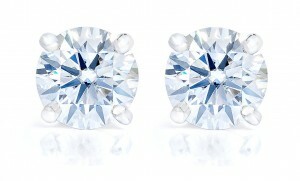 4/15/19 - We have two very likely last pairs of our Amora Eternity in 1ct each ear (2.10ctw). One is colorless (E color) , one is near colorless (G). This is likely the last 1ct each ear colorless we'll have as we are out of rough for this size (and 6mm). 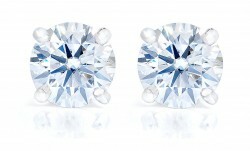 3/7/19: A limited number of 4.20ctw (2.10ct, or 8.2mm each ear) are now available. These are Near colorless (G/H) which is actually rare for the Amora Eternity...but we will have a few pairs available for sale. These are priced at $1599, a substantial savings over the normal pricing of $1930. 12/2/18 - We sold out of the most recent restock, but have one last group of earrings restocking before Xmas - inventory has been updated to reflect available quantities. These will be ready to ship after Dec 12th, with about two weeks remaining before Xmas! 11/20/18 - As expected, we are currently sold out. 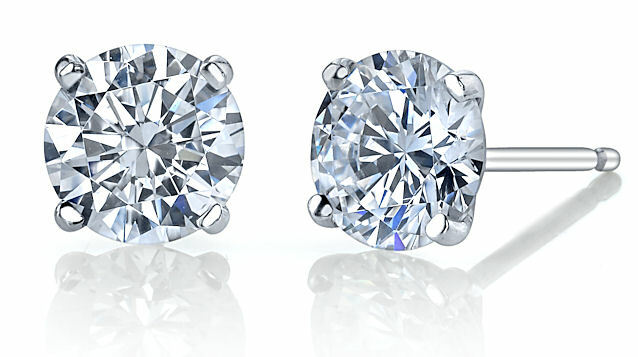 We will have 2-3 more pairs of 1ct each ear (2.10ctw) and 1 pair of 2ct each ear, ready by the first week in December and have made these available for order. These will be the last earrings available before the Holidays! 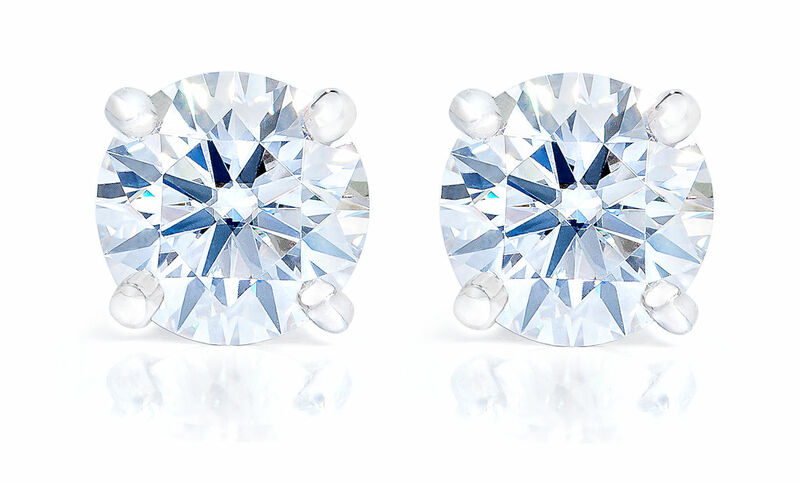 Current special: 4.14ctw (~2.07ct each ear, 8.18mm) - E color, VVS average - Universal Pricing, no cert - normally $2450, $1999 during intro period (save $450). Our stunning, Amora Super Ideal Eternity H&A gems set into 4 prong, platinum martini settings with Protektor locking back system - the ultimate gem for the ultimate stud earrings! Our universal priced Amora Eterrnity earrings are true, Amora Eternity H&A gems just without the independent certification process and priced at a flat, or universal, $525/ct. This new option was requested frequently by customers who wanted to have the beauty and sparkle of Amora Eternity's on their ears, but without the need for the certification and details of each Amora Eternity. 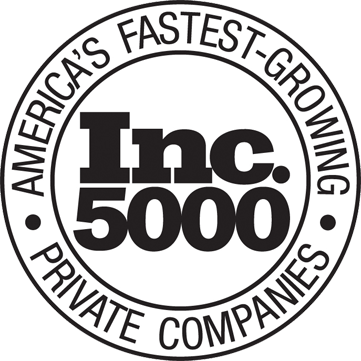 Thus, these offer simpler pricing and lower cost/time of production by omitting the independent certification for each Amora. These are still true, Amora Eternity H&A verified as usual via our Sarin HD system at our production facility, and independently reviewed by a Graduate Gemologist before being put into our Universal Priced Eternity program. The average color is E, and average clarity is VVS. 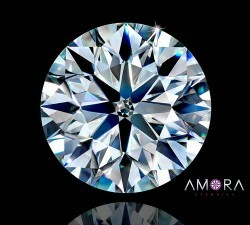 Below, you can compare an Amora Eternity vs a $45K H&A Diamond and see if you can tell which is which with our Amora Challenge - An Amora Eternity compared to a $45K H&A Diamond, in 5 types of lighting. Can you tell which is which? Seeing is believing! We've sold a lot of earrings over the past decade, and the clear winner for the most popular is our 4 prong Martinis with Protector locking backs. Thus, we've focused on perfecting the logistics of these in order to pre-stock, reduce the cost per pair while perfecting the setting work, and make them available in Universal flat rate pricing to further maximize the beauty/value equation for the Eternity studs. These earring settings feature our incredible Amora Eternity Super Ideal H&A round centers, with Martini-style mountings in order to fit snugly with minimal droop during wear. These ship in our all-wood earring boxes, ensuring a quality presentation experience versus many of the 'felt' holders others ship their earrings in. Details, Details, Details: In addition - we use Platinum for the mountings and then finish these with rhodium plating to give you a stunning high gloss finish while keeping the durability of platinum. We also polish the interior of the earring prongs before seting (this is normally only done in the finest of earrings) and then set the Eternity Amoras, to ensure that every angle of your Eternity studs, even in the interior, has sparkle and life.